The first PAL event took place on July 22, 2001. In it 8 athletes of a weight category up to 73 kg participated. The athletes pulled on the left and right hand. One of the proposed athletes for this tournament was young Rustam Babayev. 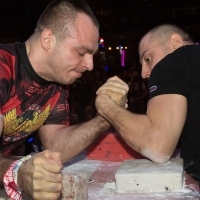 After the European Championships in Druskininkai, Lithuania (June 2001), the leadership of the Ukrainian armwrestling federation invited Rustam to take part in the first PAL tournament. Due to lack of experience, Rustam was credited to the tournament reserve. Two days before the event a force majeure happened. One of the participants of the tournament, Alex Mundzhishvili, was unable to cross the Polish border because of problems with travel documents. It was too late to call Rustam Babayev from Kharkov, Ukraine to replace him. So the historical eight, has turned into a historical seven. Despite the fact that Babayev missed the very first PAL event, in subsequent years, it became clear that Rustam Babayev is an outstanding athlete who will dominate the categories of 78-86 kg, and today in the category 95 kg. After the break of 2013-2015, almost all arm-wrestling fans have started to write off Rustam from accounts. But, after his return to the arena and the colorful performances in 2016-2017, it became clear that he returned to stay and will remain a thunderbolt for even the world’s strongest heavyweights for a long time. Rustam Babayev is an expert in the “hook" style of pulling. His rival on the anniversary Vendetta, Tim Bresnan, also pulls in the hook very well. Even such a powerful and unpredictable athlete as Genadi Kvikviniya could not overcome him in a hook. Tim Bresnan has good endurance and very well fights in top-roll as well. Today, Rustam Babayev and Tim Bresnan do not disclose their plans for the style in which they are going to fight. Also little is known about the changes in their training process. In his interview, Tim only noticed that he was using some new way of working with weights. This fight is expected all over the world. To predict today, who will be the winner in this battle of legends, is almost impossible. Levan Saginashvili: Armwrestling is an honest, men’s sport. What is Armwrestling Fan Collection from PAL?